Between 2017 and 2018, the number of houses sold in the Brisbane City Local Government Area (LGA) grew by 5.0%, yet the median house price softened by -1.0% to $670,000. The Brisbane LGA unit market has also become affordable as prices softened by -1.0% to $439,000 in 2018. A key finding in this report was the difficulty to find affordable and liveable houses in all pockets around Brisbane. In previous reports, suburbs with affordable and liveable houses have been spread throughout Brisbane, however for the first time it is all concentrated on the north side of Brisbane. In Queensland (QLD) the proportion of income to meet home loan repayments increased to 28.1% over the past 12 months to the June 2018 quarter, and the number of first home buyers decreased by -3.6%. These figures suggest that QLD housing affordability has further declined3, as over the past 12 months to December 2017 quarter, the number of first home buyers increased by 13.4%. Table 2 provides the percentage of suburbs in Brisbane that is available for house buyers. 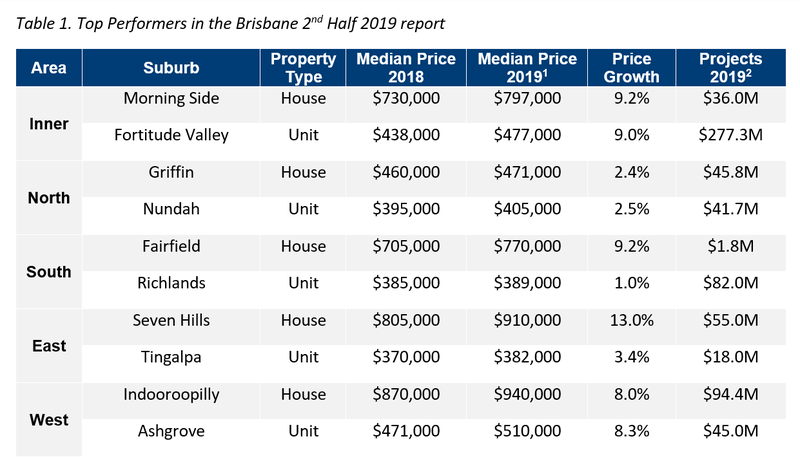 Over the past 12 months between the 2nd half of 2017 and 2nd half of 2018, there has been a softening in the dominant price points for houses in Brisbane. Those with a budget of under $500,000 have increased access, from 10.6% in the 2nd half of 2017 to 12.4% in the 2nd half of 2018. The $500,000-$800,000 price bracket remains the dominant price range in the 2nd half 2018, with a slight decline in the amount of sales activity. This is reflective of the -1.0% annual median price softening in Brisbane LGA. Higher end price ranges ($1.0M- $2.0M) have declined in activity, whilst the $2.0M+ price bracket has vanished in the 2nd half of 2018. The current Brisbane market suggests it is an ideal time to purchase property, as auction clearance rates for QLD are falling well below 50.0% and a dominant shift to lower price ranges. Affordable house suburbs, those with a maximum property sale price of the QLD average state loan plus 60% premium, as per Brisbane 1st Half 2018 hotspots report, exist. They are: Wynnum West, Doolandella, Tingalpa, Coopers Plains, Boondall, and Taigum. Although they meet the affordable criteria, these suburbs fail to meet the liveability criteria. To meet liveability criteria, a 75% premium needed to be added to the average state loan. This is quite close to the 91% premium that needed to be added to purchase the median house price in Brisbane Metro. This suggests that those looking for basic liveability aspects must be willing to pay a high premium, making the cost of liveability quite high in Brisbane. That said, this is not as high as Sydney and Melbourne, which still makes Brisbane the more affordable option between capital cities. Interestingly, Algester and Bracken Ridge, two suburbs identified as affordable and liveable in the 1st half of 2018, experienced high price growth in a short timeframe of 6 months, and no longer meet the affordability criteria. This suggests the need for a more strategic approach to quickly improve liveability conditions in several affordable areas. Considering all methodology criteria (property trends, investment potential, affordability, project development, and liveability factors), Table 2 and 3 identify key suburbs that property watchers should look out for. There have been slight fluctuations in the Brisbane rental market over the past 12 months to Q2 2018, with the highest spike in rental prices in Q1 2018. That said, rental prices have largely remained stable during this time frame. Brisbane Metro’s vacancy rate continues to trend downwards since December 2017 and was at 2.6% in June 2018, back under the Real Estate Institute of Australia’s healthy benchmark of 3.0%. This suggests that the Brisbane market is re-absorbing the oversupply of residential accommodation. Brisbane Metro rental yield is 3.8% (houses) and 5.0% (units), well above that of Sydney Metro (houses 2.7% and units 3.7%) and Melbourne Metro (houses 2.7% and units 3.9%). Brisbane will focus on residential projects in the 2nd half of 2018, with approximately $1.4B dedicated to this sector. This will cater to Brisbane’s population growth of 2.0%, which is the second highest growth across Australia between year 2016-2017. Brisbane Quarter the One Residential Tower ($300.0M) is the main residential project, set to deliver 466 units. The Wickham Street commercial tower ($90.0M) is a key commercial project. The main infrastructure project is the Brisbane International Cruise Ship Terminal ($100.0M). With $3.3B worth of development in the pipeline or under construction in 2nd half 2018 there are many exciting projects that will further attract commercial activity and population growth. Property trends – all suburbs considered will have had a minimum of 20 transactions for statistical reliability purposes, with positive price growth between 2017 to 2018. Investment – as of June 2018 the suburb will have an on-par or higher rental yield than Brisbane Metro, and an on-par or lower vacancy rate. Affordability – suburbs with a median price below the maximum sale price of state average home loan plus allocated premium percentage. In this report 75% (house) and 20% (unit) was added to the average QLD home loan, which was $349,165 as at June 2018. This is below the 91% (houses) and 25% (units) premiums needed to purchase the Brisbane LGA median price, thus more affordable for buyers. Project development – the suburb has a high total estimated value of future project development for 2nd half 2018. This ensures sustainable economic growth, having a positive effect on to the property market.